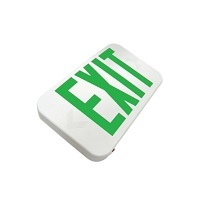 The Howard Lighting HL0301 Series slimline thermoplastic LED exit sign offers ultra-bright, energy-efficient, and long-lasting light through the use of red or green LEDs. The ultra-compact and low-profile designed fixture also includes EZ snap-out chevron directional indicators. The fixture is easily mounted to a wall or ceiling thanks to a universal surface mount and EZ-snap thermoplastic mounting canopy. And its V-0 flame retardant and available in white or black finish.